Clique apartments focus on bringing an unprecedented level of craft and quality to modern living in this attractive new Ivanhoe development. A collection of just eleven individual residences, including a whole floor penthouse, Clique is entirely exclusive, set to deliver an unbeatable living scenario for a selection of discerning buyers. 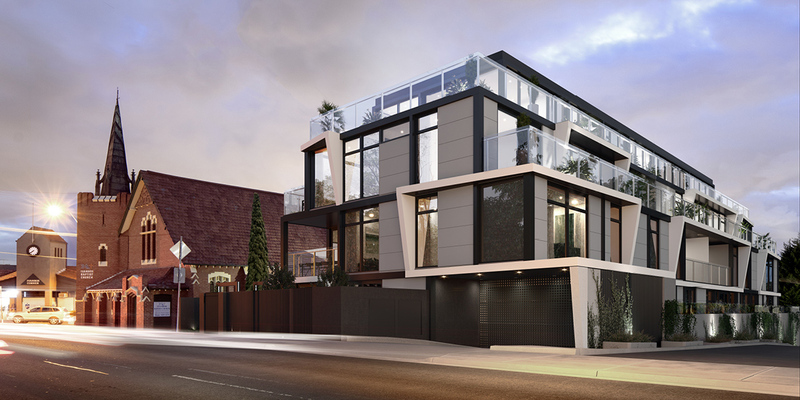 Designed by Ivanhoe locals, the four-level residential statement is a collaboration between two highly respected names in the industry, Peter Brook, Director at Peddle Thorp Architects and Chris McCue, Director of Interior Architecture at Carr Design Group. With a deep understanding of the local context and a vested interest in Ivanhoe’s future, the two developed a design concept that would convey the essence of what it means to belong in Ivanhoe. The result? An invitation to become part of the Ivanhoe clique in the form of an elevated living opportunity. Many apartment interiors will be described using the word ‘light-filled’, but rarely do designers deliver something that truly lives up to this. At Clique, the phrase is given a new meaning altogether. The homes are unequivocally designed for those who love the outdoors and wish to incorporate its beauty into their home. Light flooding through the expansive windows highlights the grand proportions that distinguish Clique and brings to life the material palette which has a classic European sensibility. Featuring honed marble, European oak, light gloss finishes and chrome accents, the overall aesthetic is simple and yet exceptional. “The tactile surfaces we’ve introduced offer a sense of depth and grace, allowing lines to remain clean and fresh,” says Carr Design’s McCue. The apartments are available in two different looks. The first is a soothing selection of calm, layered neutrals that are paired with whites for a fresh statement. The second has a more contrasted appeal and richer look, constructed from deeper shades of charcoal and wood grain veneer. Clique’s kitchen is a beautiful space made of rich materials for a rich experience. 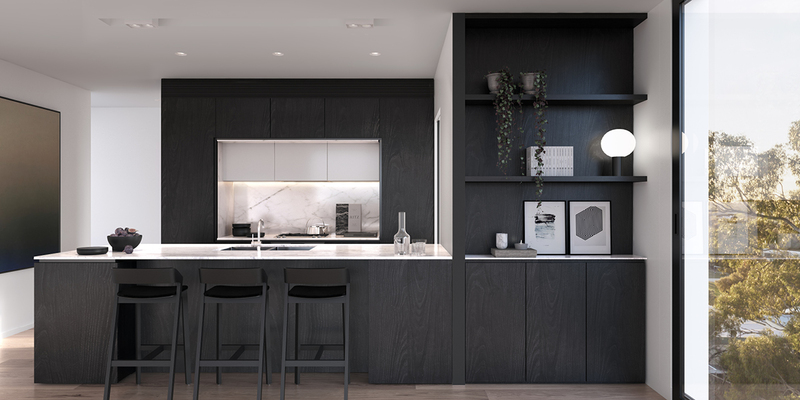 A refined and slender marble benchtop floats above the joinery to lend the area a delicate touch while the inclusion of top-tier, integrated Gaggenau appliances and smart storage solutions ensure it is functionally robust. The bedrooms are fit for a king size bed and include an impressive walk-in wardrobe with spacious and dedicated compartments – the stuff of dreams for fashion addicts. In the bathrooms, natural stone finish tiling wraps around the walls to delivery a minimal and uncluttered atmosphere for your morning routine. The generously scaled space allows for the inclusion of a shower and a bathtub, to suit your varying needs and desires of the occupier. As much as the apartments invite the beautiful outdoors in through expansive glazing, Clique’s alfresco areas invite the features of indoor luxury outside. On the balconies and rooftop terrace, no expense is spared in creating an atmosphere for indulgence. From the elegant tiling to the gorgeous city skyline views, these spaces are designed to craft memorable moments. Ivanhoe offers easy access and commutability, making travel to the CBD simple either by car or by public transport. But the area itself is also well served by its own amenity, with leading hospitals, sports facilities and top schools heightening the neighbourhood’s appeal. Local foodie treasures include Va Tutto Cafe Bar & Restaurant and Cafe Docasa – two places sure to lure you from your state-of-the-art kitchen on a regular basis. Three bedroom apartments at Clique start from $1,125,000. Register today for your pre-release opportunity to inspect the display suite before market launch. For more information or to enquire about Clique Ivanhoe, click here.